From the top of Kiama the view is of trees, fields and hills that sweep long into the horizon, broken up by homes with manicured lawns and a deep blue ocean in the distance. But an unnatural orange has invaded this coastal holiday town – men and women with bulldozers and bores, stop/go lollipops and fluoro jackets are ubiquitous on footpaths, driveways and local shops. Underground lies some of the hardest rock known to man. It built much of Sydney, surviving generations of erosion, and fights the NBN at every turn, street by street. This is the largest of five first release sites trialling rollout methods for the National Broadband Network. Half will be run along power lines while the rest will be done the hard way – none of it can run through Telstra’s existing ducts. But as NBN Co churns its way through stuff that makes concrete feel like butter, ARN went behind the scenes to find out why a blue-ribbon Liberal seat has one of the highest sign-up rates in Australia. The Australian company picked to do the job, Transfield Services, has an annual revenue stream of $4.1 billion and 28,000 employees – relatively speaking the Kiama rollout is very small potatoes. But a job done well in these challenging circumstances could lead to bigger and better NBN Co contracts – if a deal with Telstra falls through the cracks, this could well be how millions get plugged in. The temporary office serving as the NBN’s headquarters is a disused Holden dealership set to be knocked down before the global financial crisis dried up the cash. Strewn across the polished concrete floor is a series of NBN artefacts; serious-looking men work on meticulous area maps next to fibre termination boxes and other technical equipment. Cabling and pipes are strewn along the floor, but the strangest sight is a cluster of tagged, muddy rocks pulled from Kiama’s soil by hapless dig crews. “To give you an ideal of scale, the average footpath is 25MPa (megapascals),” NBN Co consultant, Fernando Calero, says. “The hardest concrete poured in the region has been 65MPa and the concrete used in Petronas Towers in Malaysia is 125MPa – it’s got steel in it and they had to invent that stuff. According to NBN Co’s local construction manager, Lance Parkes, the rocks can play havoc on equipment and timetables. A simple job can slice through dirt and be done in hours or destroy drill bits and grind away against construction-grade basalt. “It’s the reason why they picked this place and they knew it was here…you just replace the drill bits and keep going,” he said. Without the ability to use Telstra’s infrastructure, every pipe and conduit must be built again. Once roads are closed and homes blocked off, drilling rigs that resemble mechanised office chairs put long shafts with drill heads into the ground. Sonic devices pulse through soil to find any rocks in the way and eventually a narrow tunnel for a pipe is created. The pipe is then attached to the drill at the end point before the shaft is pulled back – taking the vital conduit with it. It’s often slow, meticulous work that can be halted at any moment by rocks or road crossing residents. As the bore rumbles and the steady beep of a reversing truck sounds in the distance, Parkes grins when I point to a Telstra pit sitting two metres from his crew. The electorate of Gilmore, which contains Kiama, has Australia’s second-highest median age at 43 years old. 19.5 per cent of locals are over 65 and since its creation in 1984 the Labor party has only held it once – for three years. But despite the aging population, and the fact that Kiama put Labor to the sword when the current NBN became a political issue, over 75 per cent of affected local residents have taken the time to fill in permission forms and get connected to the National Broadband Network. To put this in perspective, all three NBN-wired towns in Tasmania are in ALP territory and have sign up rates of just 50 per cent. Parkes was a 25-year veteran of Telstra in Canberra and holds shares in the company. Like many locals, he chose Kiama’s beach-side lifestyle as a comfortable home for his semi-retirement before joining NBN Co in this role. “Being a Kiama resident I thought we’d have more problems and issues, especially as we’re a blue ribbon Liberal seat,” he said. “Opt-in processes have worked here fine and I haven’t seen a reason to have opt-out. Local sensibilities are even found in the health and safety briefing given to visitors who are instructed about the “parochial” nature of some Kiama residents and the need to refrain from naughty language while out and about. That’s not to say there haven’t been problems – Coalition MP, Joanna Gash, went to all the way to Parliament House when an upset local found their nature strip had been destroyed by Transfield digging. 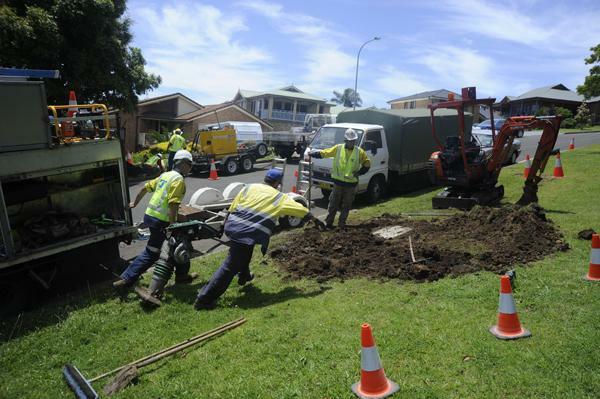 The very nature of NBN’s rollout means heavy trucks and loud diggers are needed for almost all underground work. Locals awake to find themselves hemmed in by men and machines at work – their little slice of coastal paradise turned into an experiment in construction. Merril, Robyn and Christine are friends and locals we find chatting beside a work site. They’ve been annoyed by the disruptions and destruction of once pristine suburbia but despite the fact they may never use it, all three are firm believers in the work being done. “I don’t need any of it and I don’t use [the Internet], but my daughter does and she says it’s important,” Merril said. “If we just let them get on with their job, the quicker they’ll get out of here. As we exit the area for the last time, Parkes points out a home with NBN cabling sticky-taped on the outside wall ready for the last piece of the puzzle – an Optical Network Terminal box. A long, thin scar of dirt runs from the kerb to the house, but part of the job is to heal the grass torn up by machines – eventually the boxes put into the ground will become part of the landscape. Kiama is running towards the NBN with open arms and the best indicator of whether Parkes is successful will be how quickly locals forget his team ever existed.